During the fifth event of the European Rewilding Network, that took place March 27, attendants from several rewilding sites exchanged experiences on natural grazing. In specific, aspects were discussed on how to start and manage herds of cattle and horses in a more natural context meaning the animals are managed with less human intervention, in natural densities, and towards becoming self-sufficient. Members of the European Rewilding Network feel it is very valuable to actively share ideas and approaches with one another as it also brings inspiration to their own rewilding work. Webinars are considered a great tool to achieve this aim and last year, several subject-specific events took place on various topics of interest to the Network members. Now the topic covered natural grazing with cattle and horses. Members from nine European countries – from Latvia to Portugal and from England to Bulgaria – attended it and two speakers shared their practical experiences from the sites they are involved in. First, Jan van der Veen working for ARK Nature and for many years based in Latvia, presented details from several Latvian locations in which natural grazing with cattle breeds and horses is taking place. Jan mentioned chances as well as challenges he comes across. Natural grazing has been adopted as a novel way to combat problems linked to the abandonment of the country side. The presence of cattle and horses appears to be good for biodiversity and also for the public as they welcomed these big animals back into their lives. At this moment, 32 areas in Latvia are grazed by cattle and horses roaming about under natural conditions. The current subsidy scheme for landowners was mentioned as one of the main challenges. Often subsidies are issued in order to intensify production, but this is not in line when it addresses nature areas in which natural processes should be the leading factors. 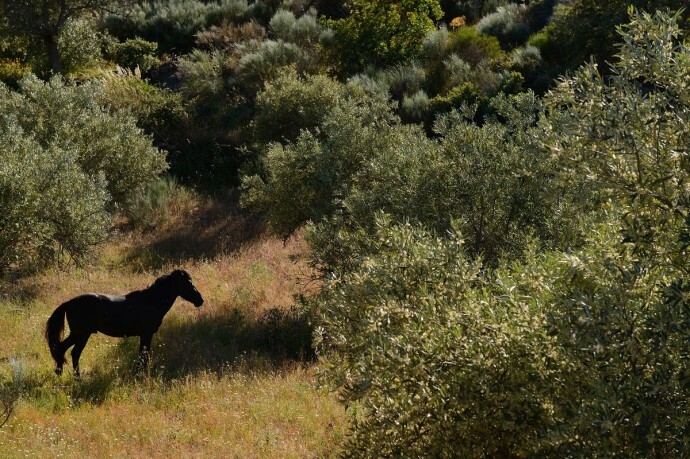 Next, Pedro Prata, team leader of the Western Iberia rewilding team provided details on the introduction of free roaming natural grazers – Garrano horses and Maronesa cows – in Faia Brava, Portugal. Both breeds are well adapted to the harsh climatic and environmental conditions, including the hot and dry summer period. Also here, land abandonment is taking place affecting the landscape. Pedro showed that natural grazing has a positive effect on several other species that rely on the presence of large herbivores. For example, by keeping ponds open which benefit the Black Stork. Also the death of large grazers provide an important food source for raptors, completing the circle of life. As tourists come to visit the area to see herds of herbivores, communities benefit since visitors stay over and buy goods. The approach used in Faia Brava already inspired others to start using this model of management, and the team involved has been asked for their expertise. A keen example that good practice is followed, meanwhile expanding the scope of natural grazing in the region. Experiences on natural grazing from Latvia shared at the 5th ERN webinar. Further information on this and other aspects linked to natural grazing can be found in the leaflet “Natural Grazing: wild and semi-wild animals as landscape architects” issued by FREE Nature and Eurosite. The leaflet can be downloaded here. The European Rewilding Network has been launched in 2013 with 25 members being part of this new initiative. In 2014, ten more rewilding sites joined ERN enlarging the networks knowledge. So far, 36 inspiring examples of rewilding covering almost 1,925,000 hectares embrace the aim of ERN to actively share information and bring the concept of rewilding forward as a viable conservation tool. ERN coordinator Yvonne Kemp sees that connecting people with their rewilding stories mitigates the barriers for others to follow similar approaches in their own field of work. ‘We are continuing to invite inspiring rewilding projects to join the network, and are pleased to see yet another initiative became member plus several others are close to join as well,’ says Yvonne. The youngest member of ERN is the Swedish Wildlife Park Eriksberg. At Eriksberg, public is given the chance to see wildlife like red deer in a natural setting, and besides the team contributes to the conservation of species such as the endangered European bison. Please feel welcome to have a look at how your inspiring rewilding initiative could become part of this growing network, at www.rewildingeurope.com/rewilding-network/.